We have already seen 18 different Need for Speed games, and it is naturally, that the developers have no innovative ideas about this racing series and its 19-th version. So they decided to use one the most popular and successful plot, that appeared in 2005, and gave it the rebirth. 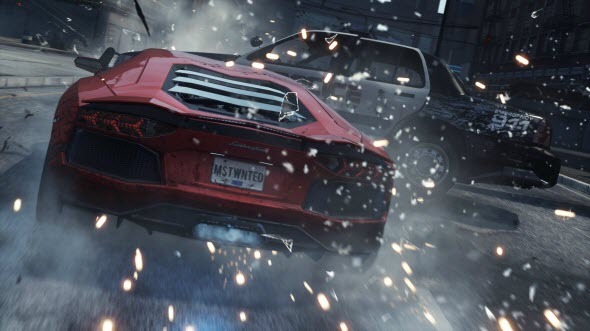 Need for Speed: Most Wanted is a remake on the old game, but will it become as famous as the original version? Let's try to find out. The first thing, that jumps to the eye, is graphics, and from this point of view Need for Speed: Most Wanted wins the praise. The developers significantly improved the graphics engine, and everything looks like extremely realistic and detailed. Every element and every stroke was designed perfectly, so even while you are driving at the highest speed, you will be fond of the city's architecture, the textures of the road, the combination of light and dark and brilliant grass under your wheels. The map in the game is not very large, but exciting and contains amazing areas. You will be able to look at it just after the short training course, and then you can select the road to go by yourself. 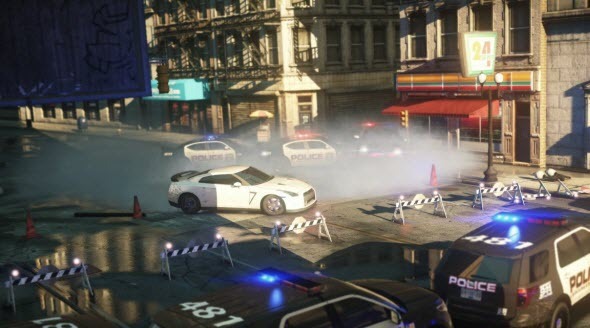 In the game there are no specified routs, so from the first minutes of Need for Speed: Most Wanted you can start exploring the urban beauty of the map without any limitations. The cars are also very nice, and even after the crash with a lot of scratches and cracks they look very real. 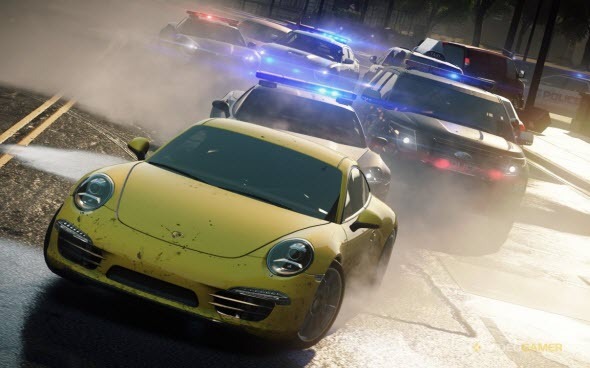 By the way, in Need for Speed: Most Wanted you will be able to drive 41 different vehicles, and among them there is even one truck. The most pleasant news is that you don't need to buy new cars, but you can simply find them on the map. Some cars are situated on the roofs or in the narrow streets, but it is not a problem to find your new car. So any time you can switch between the automobiles and use the advantages of different types of vehicles as you need. During the game you will be able to gain Speed Points and then spend them, boosting your car. To make your car better, just find the service station. After repairing and boosting your automobile changes its color, and you are able to continue the race with the updated and upgraded car. It is time to say some words about the plot of the game, but unfortunately it isn't worth any complement. 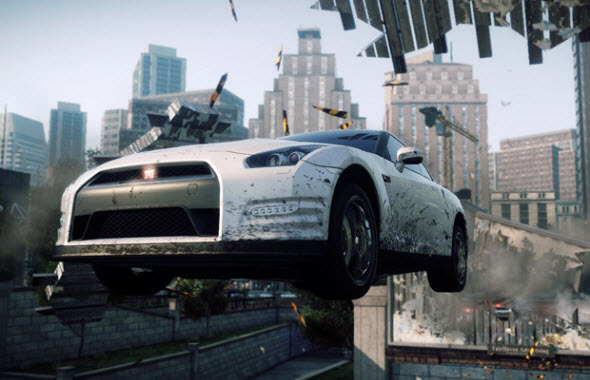 As in the first Need for Speed: Most Wanted game you have to win the title of the most badass racer in the city. So you need to break the rules, crash the billboards and run from the police. 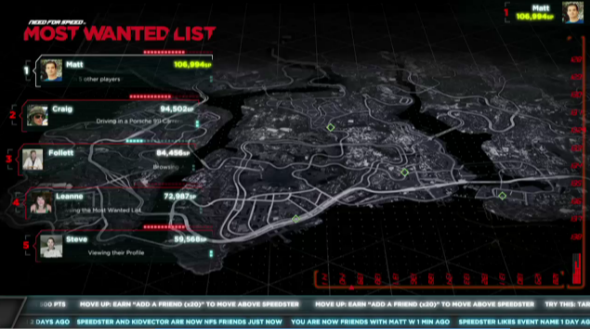 There are ten most wanted drivers in the game, and you must outrun each one of them. But your opponents are not the real people, they are not unique and don't have any temper. They are just the numbers and cars in the top-list, and so the race is not exciting, but a little bit automatic. Of course, Need for Speed is just a racing game, but most of previous parts in this series were more impressive and thrilling. The one thing, that really amazes, is the police. The police automobiles will hunt you everywhere, trying to catch or take you off the road during the race. They can ride at the highest speed, so don't underestimate them. And if they don't succeed trying to catch you, they will call SWAT, and the racing will become extremely dangerous. 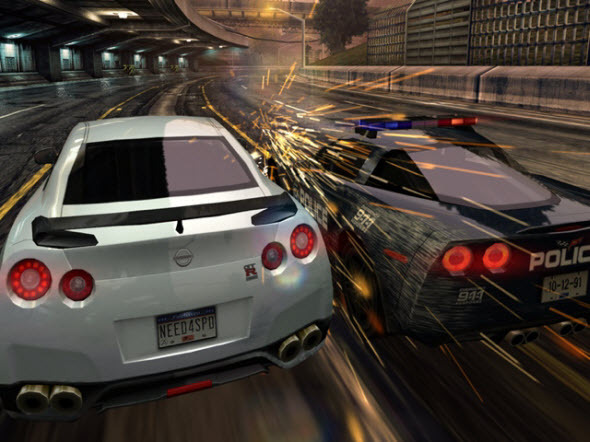 If you are tired from automatic race, you can try online multiplayer mode, that brings a note of surprise. Playing with your friends or with the random people, you can compete with real opponents and prove everyone that you are the best. For the online mode the developers added an interesting feature: you can see your face on the city's billboards, if you are able to pass by them at the highest speed. The racer that has driven faster than others, becomes the new face of the streets. But in online mode, as always, there are too many cheaters, so sometimes this challenge will be completely frustrating. Another one Need for Speed game is just... another one. It has swings and roundabouts, it is worth your time, but it doesn't bring something innovative. But if you missed the furious cars, then it is your chance again to be involved is fascinating race.